I read this article and found it very interesting, thought it might be something for you. The article is called City Of Port Phillip shows best practice consultation with its Acland Street Upgrades and is located at https://www.bangthetable.com/blog/city-of-port-phillip-staff-pick-on-the-acland-street-upgrades/. Topic: The City of Port Phillip is looking to upgrade the Acland Street precinct, which is one of the most visited areas of the beachside suburb of St Kilda, filled with cafes, cake shops, and beach-ready pedestrians. This is the second round of consultations for this project. Excellent consultation practice: During stage one of the consultation in March, the public was invited to leave feedback on proposed street upgrades. At that stage, open forum questions led to high levels of participant feedback. Now, the team has uploaded a draft document, which incorporates past feedback, as its centerpiece. It is great to see the impact of public input into the proposed changes. Clear project description: The title description is short and simple. It provides clear context about consultation achievements so far and expectations for the future. It has an obvious call to action and consultation closing date. There’s not much more you can ask for! Use of SlideShare: Our previous staff pick highlighted the terrific use of custom widgets such as SlideShare to add design elements and functionality to an EHQ site. The City of Port Phillip is using SlideShare (on top right of screen) to present the planning proposal in a survey. We believe they are the first to do so! Why use SlideShare? Because it allows you to showcase a document in a visual way without needing to download anything, which is important for large documents. It is also accessible via mobile devices and a great tool when participants are required to read a document or fact sheet before engaging. Use of the Newsfeed tool: The Newsfeed is designed to keep users up-to-date with a consultation’s progress. This is crucial for projects with a multi-stage consultation that requires repeat visitations by participants. Note: Whilst the Newsfeed is an excellent communications tool, if your consultation contains a survey, it should appear first to site visitors (e.g. on the first page/tool tab). The Newsfeed can then appear in a second tab. This is because visitors are more likely to engage with the first thing they see when they visit a page. Twitter widget: The Twitter widget remains one of the most popular custom widgets across all EHQ sites. This project features a project specific feed using the #aclandst hashtag, which is fantastic. Tool tabs: It is important to name the Survey and Newsfeed tabs with short and catchy titles otherwise the title will truncate and/or appear messy. 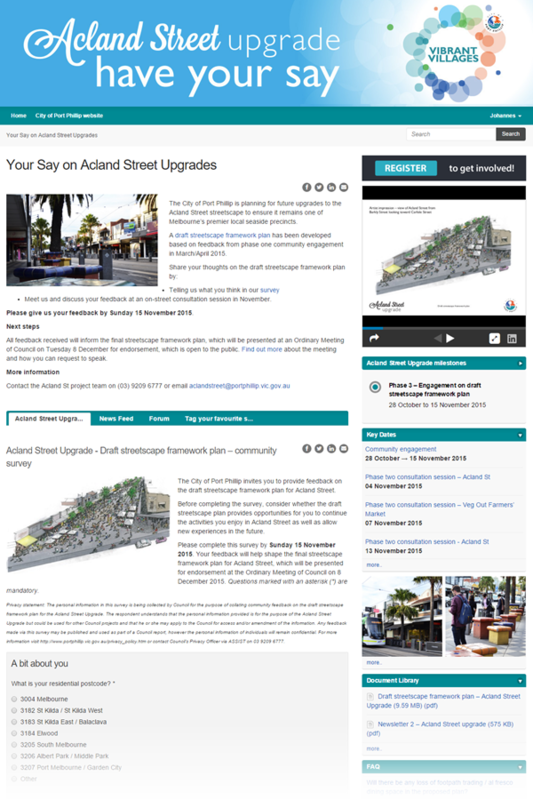 For example, the survey could have been named “Acland Street Community Survey” instead of the lengthy “Acland Street Upgrade – Draft streetscape framework plan – community survey.” In addition, the newsfeed could have been named “Project Updates” or simply “Updates”. Demographic information in the survey: The survey asks participants for basic demographic information (age, gender, etc.). However, IF you already ask for this information in your sign-up form, you don’t have to repeat the process as this information is collated alongside the survey response. The City of Port Phillip may have recently changed the sign-up form and hence haven’t collected everyone’s details. If you are working on a new project think about the information required in the sign-up form before engaging with the community. The engagement team at the City of Port Phillip have gone to great lengths to understand all the functionality of EngagementHQ, which has resulted in this fantastic consultation. A consultation that showcases the Council’s terrific understanding of EHQ and online engagement practice. This is another great consultation as part of the Acland Street Upgrades. Let’s hope for a stage three so the City of Port Phillip can go for the hat-trick! NOTE: The above is based on a visit to the site on 02 November 2015. Changes made to the project after that date may have altered the appearance of the project.